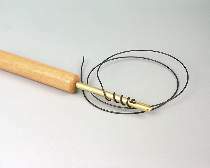 Insert wire into grooved slot and turn tool to create your own 5/16" diameter wire coils. Use with our 1790 18 gauge dark annealed wire or 19 guage Galvanized wire. Prices shown are 50% off our regular catalog price!